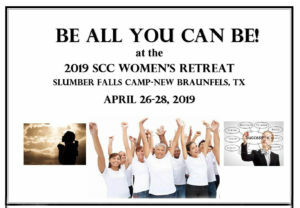 Be All You Can Be at the 2019 SCC Women’s Retreat at Slumber Falls Camp, New Braunfels, TX on April 26-28, 2019. Connect with God together as women of faith in a beautiful natural setting. Focus on how to be the best we can be by relying on Christ and getting past the “I cant’s” and focusing in on the “God cans”. Worship and participate in fun activities and workshops to support spiritual renewal and growth. Eat freshly prepared meals and morning coffee bar. Cost is $100. Visit the Slumber Falls website to register. You may also contact Lisa Wooten-Shelvin at liwoshel79@gmail.com or Stacey Silvey at the campsite at (830) 625-2212 for more information. This year is the 60th Anniversary of the Women’s Retreat at Slumber Falls Camp! Can’t wait… See y’all Friday! !